Good morning! 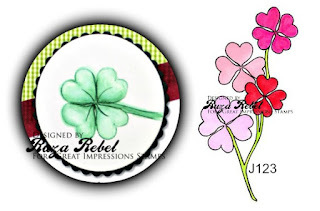 Ruza here to share a friendship card featuring the J123 Heart Flowers and E828 Lucky to Have You Sentiment available at Great Impressions Stamps. With Valentine's Day over I chose to create a St. Patrick's Day card using part of the lovely J123 Heart Flowers. Using a Marvy #72 Pine Green Watercolor Pen I inked up the bottom portion of the stamp, stamped it on watercolor paper, did a bit of water coloring, and used my circle dies to cut the image out. 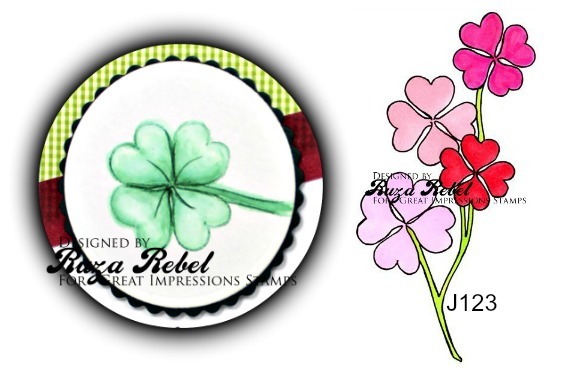 Next I created my background, added the E828 Lucky to Have You Sentiment, added my 4-Leaf Clover and some enamel dots. So pretty, Ruza. Love how you used a portion of the stamp.